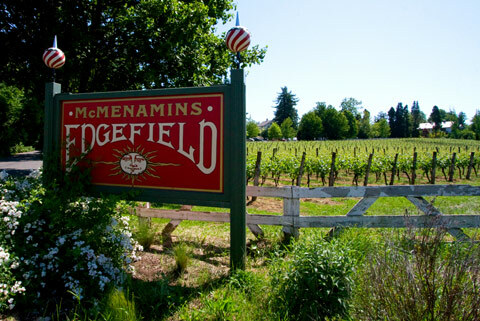 Since its inception in 1990, McMenamins Edgefield Winery has thrived on an ethos of experimentation, striving to help create and highlight the diversity and quality of our winemaking region. From the founding association with the Willamette Valley’s cool climate viticulture to a range of vineyard sites stretching up the Columbia Gorge to the Columbia Valley, Edgefield crushes 350 tons of grapes annually to produce a range of bottled and draft wine — all offered throughout McMenamins eclectic neighborhood pubs and gathering spots in Oregon and Washington. The Historic Edgefield property in Troutdale, Oregon, is a destination resort that includes a hotel, brewery, winery, distillery, spa, concert venue, seven bars, restaurants, golf, organic gardens and more. Stretches of vineyards dot the 74 acres as well. In the Edgefield Winery Tasting Room, nestled in a red brick cellar on the grounds, four wine flights lead the exploration of the diversity of offerings. From the estate-grown Poor Farm Pinot Gris to rich, lush Syrah; from blush to sparkling and one-of-a-kind fortified dessert wines, guests are sure to find a wine to enjoy in the intimate candlelit setting, in view of the winemakers and with free live music nightly. We offer wines at different price points, aiming to share our bounty with a wide audience, hoping we can share the same communal spirit as in the making of our handcrafted wine. View our entire events calendar.